The guests were greeted with a Pomegranate Fizz and Blistered Tomatoes. You will see the recipe for the POMEGRANATE FIZZ written on the tablecloth in the photograph below. Our first guests to arrive were happy to pose for a picture holding their cocktails and sporting those fabulous red lips! Preheat your oven to 350 degrees. Mix the cherry tomatoes, olive oil, garlic bulb, rosemary, thyme, salt and pepper in a casserole dish. Bake the tomatoes for 50 minutes. Stir the mixture every 15 minutes or so. When the tomatoes come out of the oven, stir in the Sherry vinegar. Serve with Fresh basil and crostini (toasted baguette). Take a crostini, top with basil and tomatoes. PREPARATION TIP: Make the crostini a day ahead. Slice baguette, place them in a single layer on a baking sheet. Brush with olive oil, salt and pepper. Bake until golden brown and crispy, about 10-15 minutes, in a 350 degree oven. Project the image onto the canvas using a projector and trace. Take a photo to your local print shop and have them print a copy of the image to the size you would need for your canvas. This was our method. Each crafter received a bag filled with paint brushes, white or red paint pens, red or white glitter, modge podge, a pencil, a paper bowl and an enlarged copy of their image choice. I suggest using silver glitter for the snowman. We found it made it POP, much more than white glitter. After all the guests had arrived, chatted each other up, drank a cocktail and filled their bellies with blistered tomatoes, Mollie started the instructions on the craft. Step 1: Turn the snowman or Santa Clause paper over and rub the back of the picture with a pencil. STEP 2: Place the pencil rubbing side down onto the canvas. Then trace the image with the pencil. 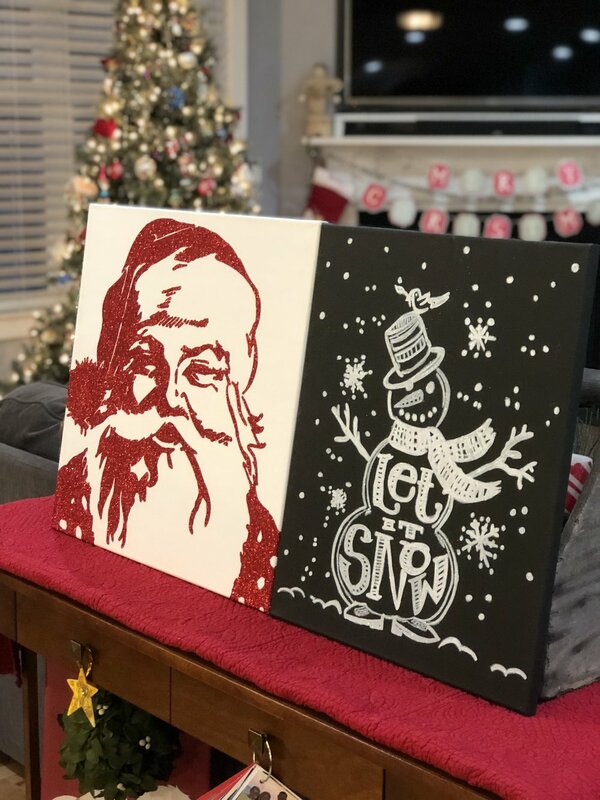 You will be left with a faint traced snowman or Santa on your canvas. STEP 3: Pull out the paint pens and paint over your traced image. This is where you will adhere the glitter. The paint will give the glitter a richer finished look. STEP 4: You will need the modge podge, glitter, paint brushes and paper bowl. Brush the modge podge over the painted area. Use a heavy hand, but work in small batches. Modge podge dries quickly. STEP 5: Add glitter and tap the excess glitter into the paper bowl. Remember to work in small sections. STEP 6: Enjoy your completed craft. While the crafters crafted, I made them a small plate of pot stickers with a dim sum dipper sauce, fried rice with yum yum sauce and sweet and sour Brussel sprouts with pickled shallots. For these recipes, subscribe to The Bell House recipe blog. You never know what recipe will make a post. Once the crafters were finished crafting, it was time for dessert. We enjoyed Banana Crepes with Salted Caramel Sauce and a Bourbon Spiked Whipped Cream. After the food was eaten and the glitter cloud settled, we were left with over $200 to buy toys for our charity of choice this year. A few crafters brought extra toys for us to donate. A huge thank you to Mollie DZigns (and my father-in-law) for the hard work in preparing the crafts. Thank you to the crafters for choosing to help us with our charity this year. Mollie & I are already looking forward to the 2019 Dine & Craft Event.